Weddings can be traumatic especially marrying off your first and only daughter. Danielle planned and executed this event culminating 16 months planning period from the time of engagement. It was perfect. Santa Barbara was a great destination; cool nights, cool days, sun, no rain, ocean breeze, good food and great venue. The colors for the wedding were orange and green and my son-in-law, a graphic artist, themed the affair with seagulls, a play-on-words of his last name. The bridesmaids were all in green, the mother’s were decked out in gold and magenta; the Dad’s wore black tuxes and groomsmen grey and the grandmothers were elegant. After the service, there were pictures, appetizers, champagne and many congratulatory greetings. My Mom got to see relatives who live in California for the first time in ten years. That was truly terrific. The dinner was salad and salmon. The salad had red and white beets along with cranberries, lettuce and other greens and a citron vinaigrette dressing. The Salmon was served with parboiled green beans with salmon covered in a delicate sauce. Very tasty served with French bread to sop up the sauce. Just before the Father/Daughter dance, I gave my “three minutes of fame” speech roasting my daughter, as a good Dad should. She loved the barbs and the references to her love of being in charge. Danielle knows that I enjoy a good surprise, so she and my son plotted together. Charles is very musical, plays guitar, banjo, ukulele and other stringed instruments. She knows that I have always enjoyed the Israel Kamakawiwo’ole ukulele rendition of “Over the Rainbow”. Charles soloed playing the ‘uke’, the singer sang the tune, and I danced with my daughter. Wow, what a wonderful moment. Danielle and my wife, Myla, used a lot of Kreinik 1/8” braid to decorate the hang tags on the welcome bags and the wedding program handed out to those attending. They both love the holographic colors and used the colors 026L and 008L. Myla also set up the table numbers using the 6250 orange and 6425 green Iron-On threads. by outlining each number-front and back in the wedding colors of green and orange. Finally, Myla handmade 100 Thank You cards and gave them as a gift to Danielle. Some of these also used the Iron-On threads to give a little “bling” to the cards without having to mess with glue or glitter. Finally, My Mom made the ring bearers pillow by taking two monogrammed handkerchiefs that she had from her Mother with a “D” (Dorothy) for Danielle and from my Dad with a “J” (Jerry) for Jon-Something old, something new and something wonderful. The Embroiderers' Guild of America will meet this September in Naples, Florida, to embrace embroidery of all kinds - goldwork, beading, ribbon embroidery, mixed media, Hardanger, blackwork, counted thread, applique, needlepoint, doll making, stumpwork. Take a look at the event brochure to see the range of incredible designs that will be at seminar: www.egausa.org/files/seminar/2011/Sem2011_brochure.pdf. If you want to learn a new technique or perfect your skills in embroidery, the EGA national seminar will be a perfect opportunity. 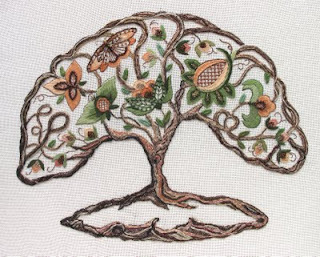 At least one classroom will have students planting roots and branches on a Congress Cloth ground in the "Tree of Life" project from talented designer and teacher Lynn Payette. It's a beautiful blend of different types of Kreinik metallic threads, from Braids to Ribbons, from basic to Hi Lustre and Holographic, from light to dark shades. Here Lynn gives us a sneak peek of this stunning design and tells us a bit about how it comes together. Lynn says: "The base (root system) of the tree is padded first with felt in single and double layers, as are some of the branches, and the initials (on the left side of the tree – each student will have their own initials formed in the branches of the tree). Some of the branches are not padded but are stitched directly on the (Congress Cloth) ground. Most of the metallics are couched down using either a fine matching color cord or invisible (waxed to make it more user friendly) invisible thread (monofilament type as used for the sewing machine). Some of the metallics are actually stitched in back stitch or, in the cases of thinner (Kreinik Very Fine #4 Braid) metallic, they are stitched using an outline or stem type stitch." Lynn used all of the Kreinik Braid and Ribbon sizes to create texture, shadow, and dimension in the design: Very Fine #4 Braid, Fine #8 Braid, Tapestry #12 Braid, Medium #16 Braid, Canvas #24 Braid, Heavy #32 Braid, 1/8" Ribbon, and 1/16" Ribbon. (Note about our numbers: the smaller the number, the thinner the thread; ie, #4 Braid is half the size of #8 Braid.) "The threads are laid out with the darker colors first to form a meandering type line on the branches, roots, etc., and then are ‘filled’ in using a variety of sizes and types of metallics," Lynn says. The design is also a wonderful example of how to use the various degrees of metallic to create a realistic design. Some of the threads are Kreinik High Lustre colors (meaning they have a bolder metallic look), some are basic metallic colors (with a softer metallic gleam). She also used some of the new holographic Kreinik colors. "It was necessary to balance the shiny's with the not so shiny's, so that the piece was more interesting," she notes. Whether you are a beginner to embroidery or a seasoned stitcher, designs like this can inspire you to play with different thread thicknesses and colors. If you want to make this particular design, take the class from Lynn at the EGA national seminar, or when Lynn teaches it in various places next year. Email us at info@kreinik.com and we will get you in touch with the designer for more information. One side note: don't be intimidated by a "guild" like EGA. With talented teachers, in a setting like the EGA get-together, you will be lovingly taught, inspired, and encouraged. There's nothing like being in the midst of people who have a passion for your passion. For more information on EGA or the national seminar, visit www.egausa.org. Amy Bunger is a talented needlework designer, author, and teacher both on and off screen (check out her DVDs). We don't know how she fits it into her schedule, but she is also a needlework shop owner. Check out our interview with Amy and learn about her "Golden Strand." Q: What is the story behind your store's name (what does it mean)? AMY: The first store that I owned was named "A Stitch in Time." There were problems with identification since there were other shops with the same name around the country. My customers would refer to the shop as "Amy's" when they talked about us with their friends, so new customers couldn't find me in the phone book. When I opened a shop in a different area of the country I knew that "Amy" needed to be in the name of the title. I was down to the wire on time to order business cards and signage when I saw a book on my parent's shelves: "The Golden Strand." Although the book was about the Gold Coast of Africa I thought the name would work well for my new shop...Amy's Golden Strand. Q: How long have you had the shop? 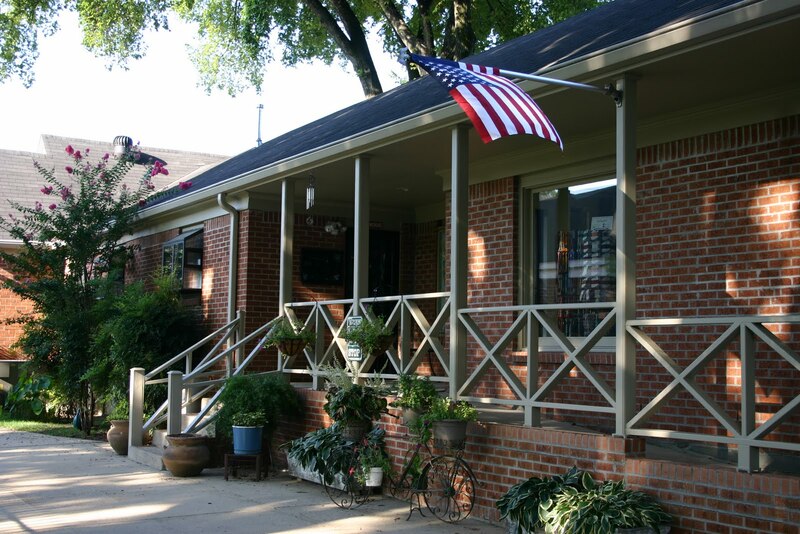 AMY: I started my first shop (Owensboro, KY) in 1979 and the Memphis, TN location was opened in 1986. AMY: The shop is all needlepoint supplies, services, and classes. AMY: Our shop team includes me (Amy), Candy (my sister), Eileen, Judy, Peggy, Jill, and Karen. Bob (my husband) runs our wholesale business situated across the driveway in a separate building. AMY: Kreinik Braids in size 4, 8, 12, 16, 32, Kreinik Metallic Ribbon, Facets, Ombre, Embellishment Trim, Japan Threads, Cord, Beadlets, Treasure Tape (red liner tape), and more. If we don't have it in stock we are happy to order it for you. AMY: Each week we have group classes (2 - 3 hours each) taught by various teachers. We offer private classes by the hour, half-day, or full day. Six to eight times a year we offer 3-Day group classes on canvas enhancement and once or twice a year Tony Minieri comes to teach either a project or technique class. We have mail order classes called "Home Study" that are on painted canvases by different designers. These classes are part project and part technique classes that range from 3 months (1 kit per month) to 12 month classes depending on the size and complexity of the project. AMY: The cute, petite, blonde actress that plays the ballistics expert on CSI Miami came in with her mother one day - - wow that was fun. Barbara Bush called and ordered some thread from us and Jill practically passed out while holding the phone. She also sent us the nicest thank-you note and we have saved it carefully. I swear I've "seen" Elvis in the store, but I might be mistaken about that. AMY: Memphis is chock-a-block full of fabulous places to eat from the "heart stopping" Gus's Fried Chicken for casual dining to Iris or Erling Jensen's on the fancy end of the food chain. The closest restaurant to us is Cheffie's Deli which is a great place for sandwich, salad, or Gelato. If you don't like their menu, just pop next door to the local pizza parlor for a great pizza. Of course, Memphis is world famous for BBQ and we must have 100 BBQ restaurants and even the worst of them is still good. AMY: Hands down it has to be the people. We become a part of our customer's lives when we are involved with their hobby. Everyone that works in the shop is a member of the family and it shows in their interest in the customers. I think that we have a reputation for being as friendly as we are helpful and efficient.